ENTREPRENEURSHIP IS ALL ABOUT TAKING CALCULATED RISK, MAKING THE BEST OF AVAILABLE RESOURCES & LIVING THE DAY TO MAX. 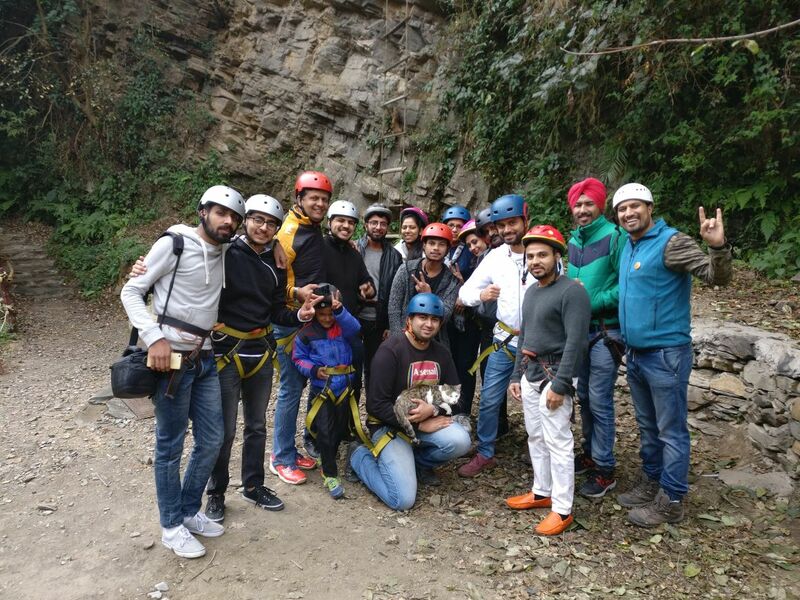 14 BRAVE SOULS & BUDDING ENTREPRENEURS LEFT THEIR COMFORT ZONE ON A COLD NOVEMBER MORNING FOR A DAY FULL OF ADVENTURE IN THE MOUNTAINS, ORGANISED BY HOLIDAY CELLAR & YO BUDDYZ. THE ENERGY OF TEAM MEMBERS PROVED THE FACT THAT THE JOURNEY SHOULD ALSO BE AS MUCH FUN AS THE DESTINATION. THE RAIN GOD WASHED THE MOUNTAINS FOR OUR GROUP. FROM AIR TO THE ROAD, FROM TREES TO EVERY LEAF WAS FULL OF FRESHNESS, AWAY FROM THE URBAN LIFE, THE FRESH AIR WAS A JOY TO THE BODY AS WELL AS THE SOUL. AFTER THE SUMPTUOUS BREAKFAST TAKING CARE OF OUR EMPTY STOMACHS, IT WAS ADVENTURE TIME. 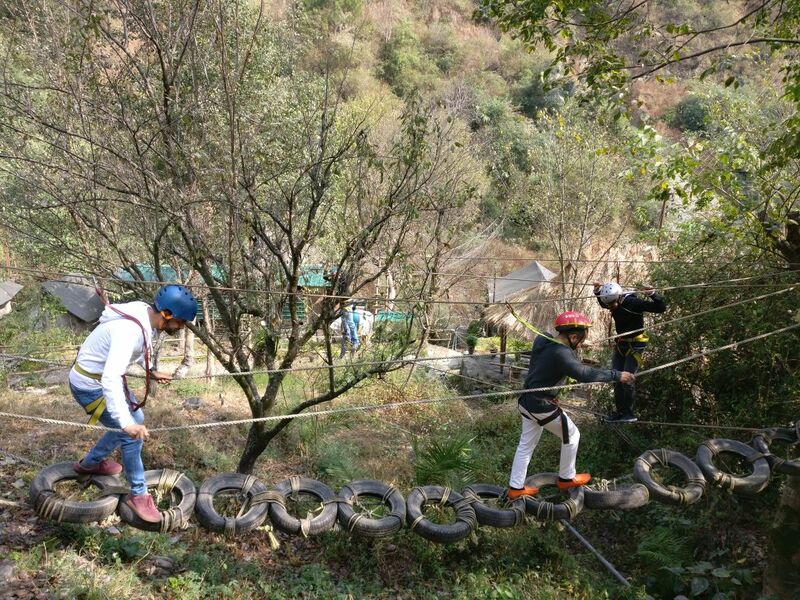 FOR THE FIRST TIME, THE TEAM EXPERIENCED ZIPLINE, COMMANDO BRIDGE, OBSTACLE COURSE LIKE TIRE WALK, RING WALK, BURMA BRIDGE, ROPE WALK. ROCK CLIMBING & RAPPELING TOOK THE FUN TO NEXT LEVEL. THE ENTIRE VALLEY WAS FULL OF OUR VICTORIOUS JOY & LAUGHTER AS WE HAD CONQUERED THE CHALLENGES. A SECRET YOGA TECHNIQUE WAS REVEALED BY MR. WALIA FOR BETTER FOCUS & RELAXATION OF MIND BODY SOUL. THE SHORT TECHNIQUE DONE WITH THE RIVULET FLOWING NEXT TO US TOOK AWAY ALL THE TIREDNESS. AS WE HAD SPENT LOT OF ENERGY, IT WAS TIME TO REFILL WITH A MOUTH WATERING DELICIOUS LUNCH. HEADING OUT FOR THE FIRST TIME WE THOUGHT THAT WAS ENOUGH BUT WE WANTED MORE. 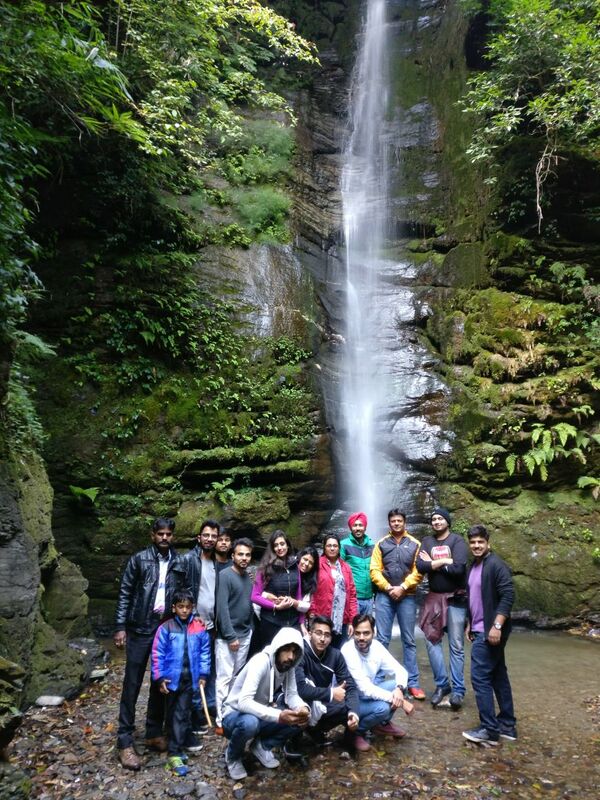 OUR ORGANISERS ( HOLIDAY CELLAR & YO BUDDYZ) SPOKE OF A WATERFALL HIDDEN DEEP IN THE FOREST & WE AGREED INSTANTLY. 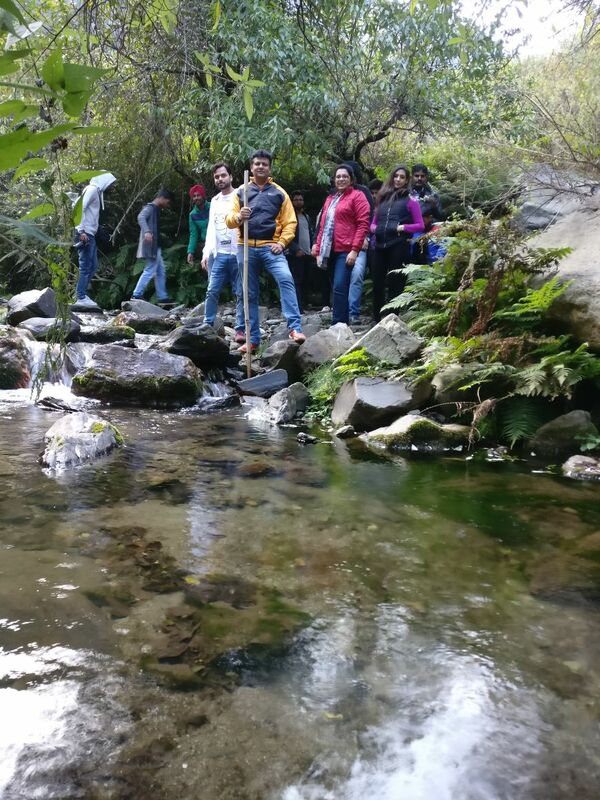 A 90 MIN LONG WALK CRISSCROSSING THE RIVULETS TOOK US TO THE MOST AMAZING WATERFALL THAT WE HAD EVER SEEN. NORTH INDIA IS NOT KNOWN FOR WATERFALLS BUT THIS ONE REALLY WAS A HIDDEN JEWEL. THE FRESHWATER & SERENE SURROUNDING MADE IT WORTH TREKKING THIS LONG. HOT TEA & PAKORAS WELCOMED US BACK TO THE CAMPSITE. WE SO WANTED TO BE LOST IN THAT CORNER OF PARADISE, THAT WE REGRETTED NOT PLANNING AN OVERNIGHT TRIP. COMFORTABLE TRANSPORT BROUGHT US BACK TO THE CITY LIFE. THEY SAY IN THE END WE REGRET THE ADVENTURES WE DID NOT TAKE, WE WERE LUCKY THAT WE DID NOT MISS THIS ONE. LOOKING FORWARd FOR MORE ADVENTURES TO ENJOY THE ENTREPRENEURIAL SPIRIT& TOGETHERNESS.